This fantastic replica Cannon is over 4ft long and is superbly detailed. It's an ideal piece to use with our extensive range of life-size Pirate figures or Military figures and adds authenticity to any Pirate or historical themed area. 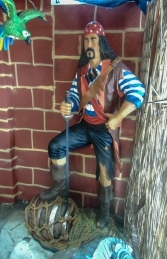 Our poly-resin and fibre-glass replica Cannon can be used on its own as a great statement piece or in any Nautical or Pirate themed area with our Pirate series statues and props to create a stunning display. This model Cannon is wonderful as a feature in or to promote shops, businesses, pubs, restaurants, coffee shops, adventure golf courses, zoos, theme-parks or even in your own home or garden.